Drug abuse is one of the most serious health problems. Besides damaging health, it has several side effects such as economic loss, antisocial behaviour such as stealing, violence and crime besides social stigma and overall downfall of the society. The International Day against Drug Abuse and Illicit Trafficking is observed on June 26th every year to raise awareness about illicit drug abuse and trafficking. Peoples, communities, and several organizations across the world celebrate this day to make people aware and indicate the dangers of drug addiction and illegal trafficking. As part of its commitment to youth development and empowerment as well as creating a promising future for the next generation of young Nigerian leaders, Salimo-Wits Foundation participated in a walk organized by Christ Against Drug Abuse Ministry (CADAM), a faith-based non-governmental organization committed to ensuring individuals, families and communities are free from the scourge of drug abuse and addiction to commemorate the 2017 International Day against Drug Abuse and Illicit Trafficking with the theme: Are You Drug Free? The walk aimed at sensitizing and raising public awareness on the dangers of drug abuse and illegal trafficking commenced from the Murhi International Television located Alausa Secretariat, Ikeja, Lagos and culminated at the CADAM office on ACME road, Ogba Ikeja, Lagos. 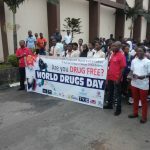 Other participant’s at the walk included the National Drug Law Enforcement Agency (NDLEA), selected secondary schools in the Ikeja environ, youth oriented NGO’s and individuals concerned about the alarming increase of drug use amongst the youths in Nigeria. Salimo-Wits Foundation Offers Hope to Students.